If you're wondering whether the H1N1 flu epidemic has infiltrated your town yet, there's an iPhone app for that. Created by researchers at Children's Hospital Boston, the new app, called Outbreaks Near Me, gives users real-time information about the type and scope of any new disease outbreaks in their area. 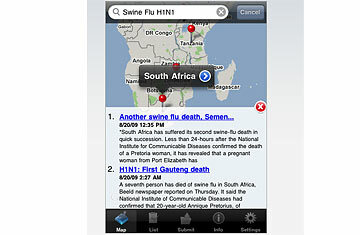 The app is based on the same network of media and on-the-ground reporting that global health officials use to detect and track emerging diseases like H1N1 and 2003's SARS. Indeed, the first details of the strange respiratory disease, which surfaced in southern China six years ago, weren't published in a medical journal, nor were they issued by the World Health Organization (WHO). Rather, the earliest hints came in the media, in stories published in Chinese newspapers about people in Guangzhou and Shenzhen being struck down by a mysterious illness. Because Chinese officials forbade official reporting of the new disease, the WHO and the rest of the international health community didn't become fully aware of the situation until the infection  which would later be called Severe Acute Respiratory Syndrome, or SARS  crossed the border to Hong Kong and then to the rest of the world. If epidemiologists had been able to pick up those early media reports about SARS, the disease might not have gone on to kill nearly 800 people. That's one of the reasons researchers at Children's Hospital Boston, together with the Massachusetts Institute of Technology (MIT) Media Lab, developed HealthMap, a website that mines more than 30,000 data sources  including news media and government alerts  and puts them on a Google Map to show where outbreaks are occurring, in real time. Whether it's measles in Sussex, foot-and-mouth disease in Taiwan or avian flu in Indonesia, as reports of diseases bubble up, HealthMap researchers scan them and post them online. The result is about as close as you can get to a real-time picture of the state of the world's health, and it's become a useful tool for both professional epidemiologists and curious amateurs. "We wanted to bring all this information to life in a way that's accessible to everyone," says John Brownstein, an assistant professor at Children's Hospital Informatics Program (CHIP), who co-founded HealthMap and Outbreaks Near Me. The iPhone app makes HealthMap information even more accessible to the average person, by marrying the map's network of global data with the smartphone's GPS function, which tracks an individual user's location. So the program enables you to find out instantly whether there are any new outbreaks close to home. "The system can deliver reports that are relevant to your location," says Clark Freifield, a Ph.D. student at MIT's Media Lab and a co-founder of HealthMap. See the top iPhone applications. The Outbreaks app also allows users to do their own surveillance and reporting  you can send messages and images to HealthMap about disease flare-ups in your area. The idea is to further broaden the net of health information beyond official sources. Think how useful a few iPhone-armed people in Mexico might have been during the initial waves of the H1N1 outbreak last spring  or how they might affect the upcoming flu season in the U.S. this autumn. "We're not sure what kind of response we'll see, but the idea is to develop a two-way flow of information," says Freifield. Certainly, opening HealthMap to user-based reports could introduce an element of chaos, and even outright panic, into disease surveillance  ordinary people aren't trained epidemiologists. Global health officials already struggle to separate the noise from the truth; for every actual outbreak of a new disease, there are countless false or overstated reports. But in an interconnected age, when both information and disease can spread in an instant, having an imperfect network is better than none at all. "This is an alert tool that is not trying to raise fear but awareness instead," says Brownstein. "We want to encourage good public-health information, and at the end of the day that's what this app is about." Knowing too much may be scary, but knowing nothing is far more dangerous. Download the new TIME iPhone app at app.time.com.